Zipza™ Pouches organize your personal items and protect your devices while on the trail. Wallet, keys, phone, power bank, cables, plus all the small stuff you don’t want lost in your pack. These are great bags for hiker ditty, first aid kits, toiletries, repair kits, and survival kits. They’re made of tough 1.43 oz/yd2 Dyneema Composite Fabric or DCF (formerly Cuben Fiber) which has thicker mylar outer layers and much higher Dyneema content to withstand the abuse of packing odd-shaped items. The material is semi-transparent to help you find stuff more easily. Super strong yet ultralight and see through too. A quick zip opening with grab tab loops and a zipper pull makes for fast loading and secure storage. The zipper is water resistant and the side seams are taped to keep moisture out. The bottom is flat for greater volume, allowing the bag to stand upright. To attach the pouch to your pack, belt loop, or ridgeline, simply clip a micro carabiner through a side loop. Chroma Zipper Pulls add a splash of color to personalize your pouch. 17 different colors and patterns allow you to truly customize your Zipza. To add one to your pouch, place an order for a Chroma, put a note in order comments to install it, and we’ll replace the standard black pull with your color choice. Pick a bright neon color to easily find the pull in the dark. If you're ordering two like-color pouches, choose different color pulls to quickly tell them apart. 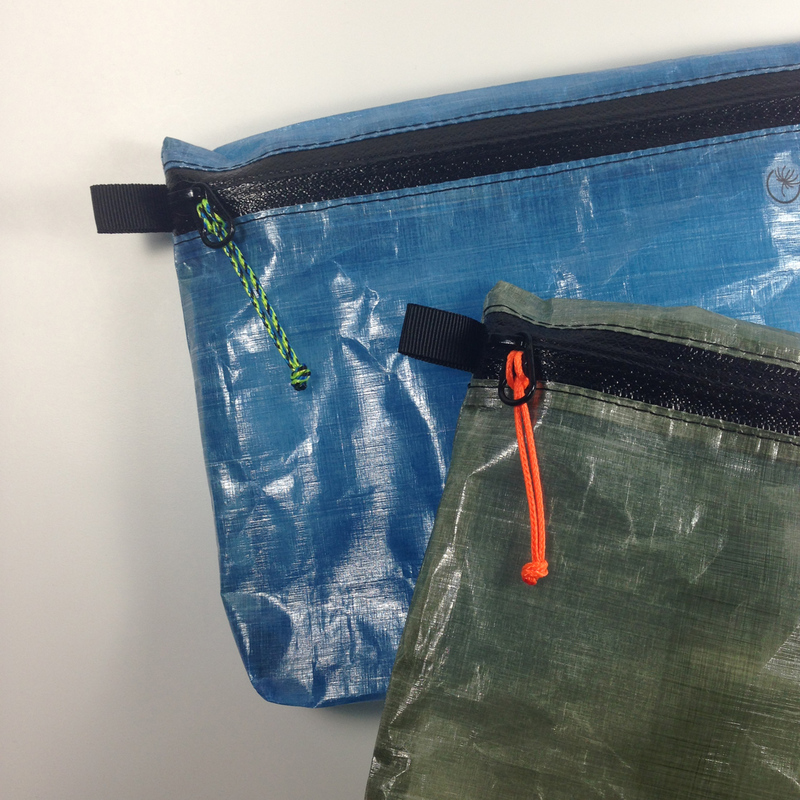 For various size pouches, different color/pattern pulls make it easier to identify them. Or use a color pull to identify the contents of the pouch. Zipza Pouches help organize and protect your valuables. They’re highly water resistant and will keep your stuff dry in typical backpacking conditions but they’re not fully waterproof and should not be submerged. *For good device fit, pouch should be about 1 in. (2.5 cm) wider and taller than the device. ‘Great for silver bugs like me! I appreciate the option of small, medium and large. ‘Buying more! I have dyneema pouches from HMG, Gossamer Gear, zpacks, and granite gear. These are the best. They feel tough without feeling heavy. The zippers feel sturdy, and the ‘pouch’ bottom hold more gear and stands up on its own. I’m a big fan. Please get the green ones back in stock. This little pouch is one of my favorite pieces of gear, I have one in my computer pack and it gets used every day. The materials, fit and finish are top tier. Clearly, there was a lot of thought put into this seemly simple object as the zipper is situated in just the right spot allowing good access, visibility, and smooth snag free operation. I plan on ordering more. This pouch is awesome for two reasons 1. It makes getting to your small items easy with the full length zip and 2. the gusseted bottom allows for it to stand up when items are in it and allows more room for digging around when looking for that .5oz flashlight and mini knife. These are so nifty I will probably pick up more to minimize my use of plastic baggies. I love it. Very durable and great quality zipper. It saves our environment from using plastic bags that I typically would throw away. No worries any more about the plastic bag opening or tearing.